Add on a color conditioning gloss to your haircut for ONLY $25! A demi-permanent toning glaze to brighten and polish your hair’s color for multi-dimensional shine, AND it only takes 15 minutes! 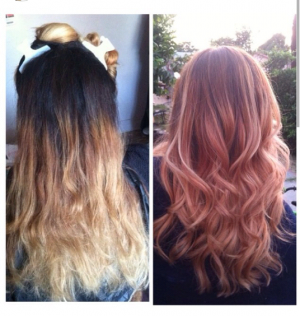 The before and after pictures are proof of what an amazing difference this will make on your hair. Make sure to take advantage of our Gardner’s Glow Facial for $75. An ultra-hydrating facial with an extended hand massage to relieve any aches from working outdoors, and rejuvenate your skin from any dryness caused by the sun. Receive 10% off of any sunscreen purchase the same day as your facial. Father’s Day is June 19th. Treat your Dad to a session of professional “man-scaping,” which includes a haircut and eyebrow wax for $40 (reg. $50) and the option of a chest and/or back wax for $ 35 (reg. $60) or $80 for both (reg. $100). Just mention these specials to receive the discounted prices.